Intended as a comedic horror allegory of the state of irrational paranoia as well as genuine fear surrounding the Swine Flu epidemic that terrified the globe a few years back – writer/director Nicolas Goldbart’s Argentine import Phase 7 is proof that anything can inspire filmmakers to serve up a new twist on an old genre. A revisionist western, a dark comedy, an exploitative work of psychological exploration, a gory medical satire or a Sergio Leone meets John Carpenter play on Shaun of the Dead divided by [Rec] times 28 Days Later – whichever way you choose to dissect Goldbart’s motion picture oddity, it’s safe to say you’ve never seen anything quite like it before. 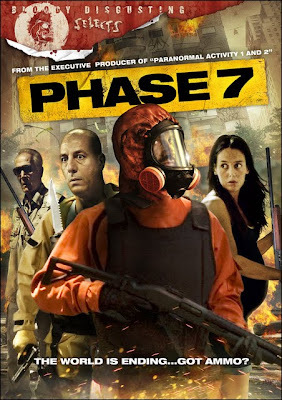 Overly ambitious and admittedly flawed, because Phase 7 is fueled by the novelty of its inventive premise that finds its leads involuntarily quarantined in their apartment following a disease outbreak, it starts to run out of gas relatively quickly after we pass the no-return point of the first act. Unable to compel us for the length of its succinct running time as something other than a thin helping of popcorn entertainment that refreshingly does inspire its audience to think more than average gory action fare. Namely, before Phase 7 settles in fully as a Swine Flu allegory, the word-of-mouth crossover film festival hit from a Paranormal Activity 1 and 2 executive producer also fascinates as a work of political daring. Given some subtle editing tricks that intercut key news footage at certain times and various supporting players in the UN like apartment building, it’s easy to view 7 as a possible consumerist parable or a Big Brother foreign policy fable in the post Bush I (and Bush II) world, making Goldbart’s film that much more appealing to a non-horror enthusiast market. Although it never fully pays off on the satirical level it initially foreshadowed as it grows a bit one-dimensional as it continues, overall it’s a very impressive and wholly original entry into the sociologically relevant paranoid horror subgenre that quarantines writer/director Nicolas Goldbart as a talented helmer that we ought to watch even closer in the future for symptoms of filmmaking fever.